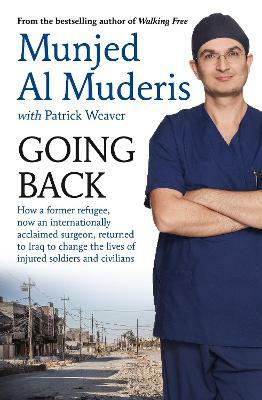 In Munjed Al Muderis's bestselling memoir Walking Free, he described his experience as a refugee fleeing Saddam Hussein's Iraq, his terrifying sea journey to Australia and the brutal mandatory detention he faced in the remote north of Western Australia. The book also detailed his... read full description below. In Munjed Al Muderis's bestselling memoir Walking Free, he described his experience as a refugee fleeing Saddam Hussein's Iraq, his terrifying sea journey to Australia and the brutal mandatory detention he faced in the remote north of Western Australia. The book also detailed his early work as a pioneering orthopaedic surgeon at the cutting edge of world medicine. In his new book, Going Back, Munjed shares the extraordinary journey that his life-changing new surgical technique has taken him on. Through osseointegration, he implants titanium rods into the human skeleton and attaches robotic limbs, allowing patients genuine, effective and permanent mobility. Munjed has performed this operation on hundreds of Australian civilians, wounded British soldiers who've lost legs in Iraq and Afghanistan, and a survivor of the Christchurch earthquake in New Zealand. But nothing has been as extraordinary as his return to Iraq after eighteen years at the invitation of the Iraqi government to operate on soldiers, police and civilian amputees wounded in the horrific war against ISIS. These stories are both heartbreaking and full of hope, and are told from the unique perspective of a refugee returning to the place of his birth as a celebrated international surgeon. Associate Professor Munjed Al Muderis is a world-leading osseointegration surgeon and Adjunct Clinical Associate Professor at the University of Notre Dame Australia in Sydney. He practises as an orthopaedic surgeon at the Norwest Private Hospital, Sydney Adventist Hospital and Macquarie University Hospital in Sydney's northern suburbs. He lives in Sydney with his partner, Claudia. Patrick Weaver is a highly regarded writer and public relations consultant who worked with Munjed on his previous bestseller, Walking Free. He lives in Sydney and has two adult children.